We were surprised and pleased yesterday morning to see one of the groups of cyclamen in our garden bursting into bloom. The snowdrops having been showing for a couple of weeks: fair enough. 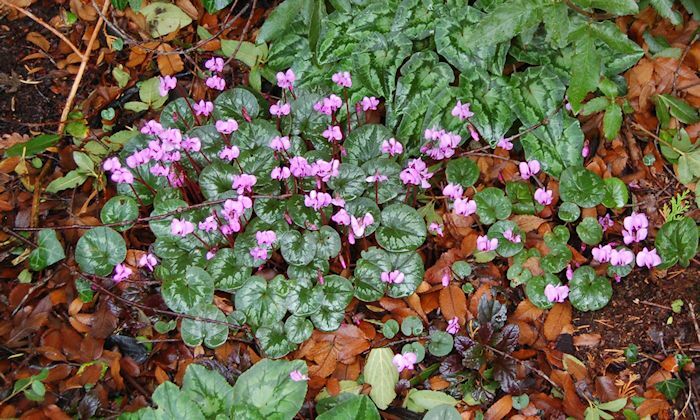 But we don’t recall ever seeing cyclamen’s colourful blossom here in Brecon so early in the year – on the 28th January. 2013 – Wet, Windy and Wonderful! We Brits are renowned for our obsession with the weather; it is one of the most common topics of conversation. And I am no exception. 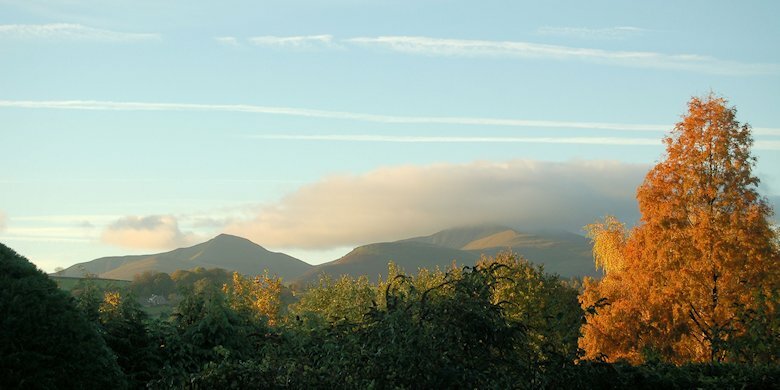 As 2014 begins, it’s time to look back over the past year, review its weather month by month, and offer some of my photographs revealing the seasonal changes in our wonderful garden here in Brecon. 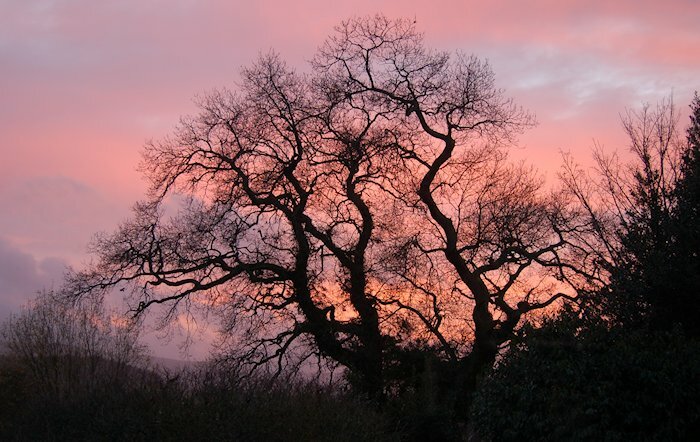 The early part was unusually dry and mild: I recorded a temperature of 14°C on 4th January. By the middle of the month winter had set in. Night-time temperatures fell to below zero for 14 consecutive days and we had our first snowfalls on the high ground. 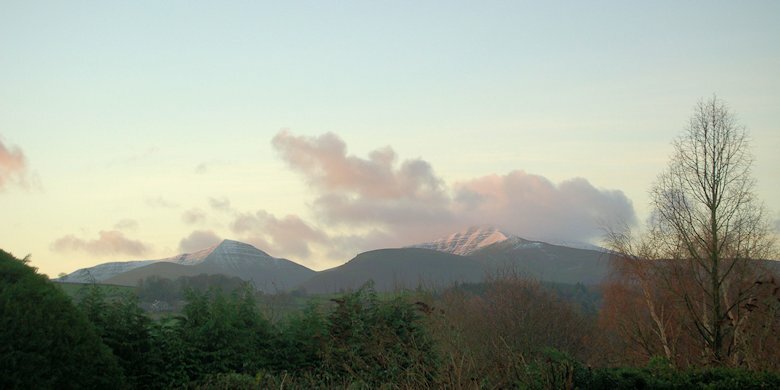 The heaviest snow here in Brecon fell on the 18th, when I took the photo below in our garden. Even the daytime temperature remained below zero for a few days, and temperature fell to minus 5°C early on the morning of the 25th January. However, the last few days in the month were quite mild and very wet. Ten centimetres of rain fell in January, mostly between the 26th and 31st. The month began in typical fashion, quite breezy but with tolerable temperatures, and little rain. The rainfall increased as the month progressed until the 15th, then we enjoyed nineteen successive days without measurable rainfall — drought conditions! So much for the proverbial “February fill-dyke”! Furthermore, several days in mid-February were unseasonably mild: the temperature rose to 13°C on the 19th of the month. 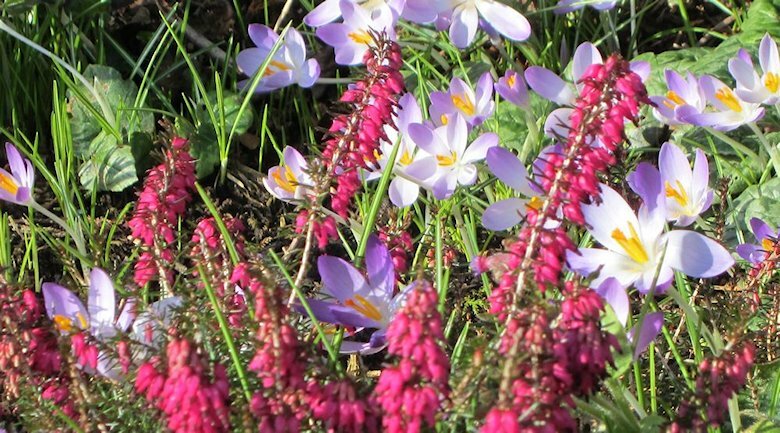 The crocuses and heather were in full bloom by the 17th. 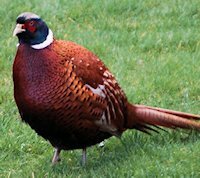 On the 27th a friendly pheasant decided to explore our garden. Apparently he also paid visits to the neighbours’ gardens. He returned several times over the next few days. 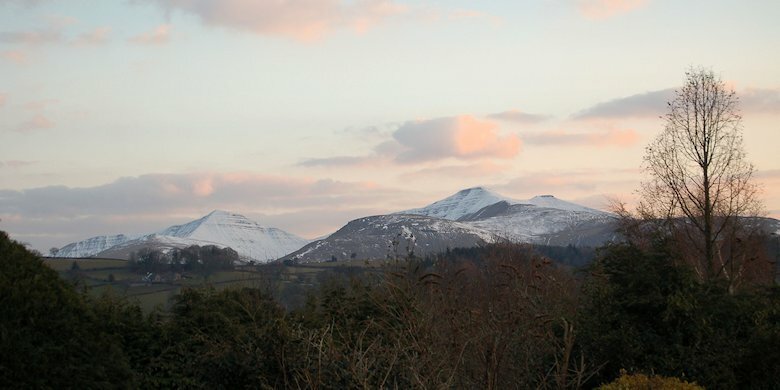 Nights were particularly cold as February drew to a close, and as my photograph shows, the peaks of the Brecon Beacons still retained a sprinkling of snow. The snowdrops were in bloom, and despite the cold, the hellebores were in full flower and the first daffodils of the year had opened, just in time for St David’s Day. All six centimetres of February’s rainfall had occurred before the 15th. Early March was quite mild and dry, with daytime temperatures peaking at 16°C on the 5th of the month. 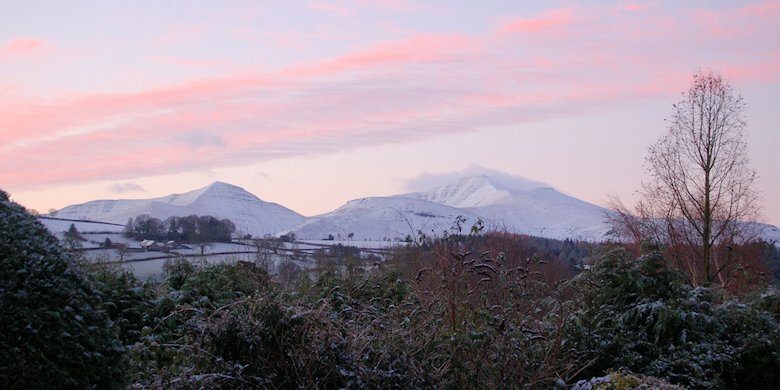 But a week later, night-time temperatures plunged (minus 4°C on the 13th), and the snow covered Brecon Beacons were a fine sight. On the 13th Helen and I spent the day in London, where we had lunch at Fortnum & Mason’s followed by a visit to the Geilgud Theatre where we enjoyed Helen Mirren’s performance in the title role of The Queen. 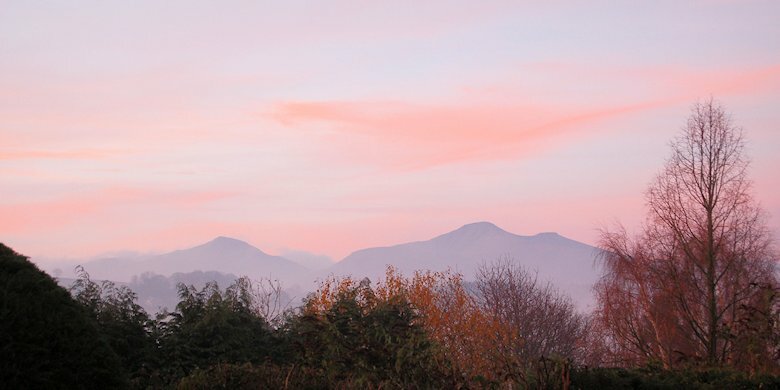 Although the days were sunny and we had no rain, the nights became increasingly cold towards the end on the month, and the temperature dipped to well below zero for fifteen consecutive nights from 24th March to 7th April. The total rainfall in March amounted to just nine centimetres, mostly between the 14th and 24th. The March cold and dry spell continued well into April, and my weather picture taken on the evening of the 5th shows the mountains still bearing a thin layer of snow. The middle of April proved wet, windy and mild, with night-time temperatures well above zero and daytime temperature reaching a peak of 17°C on the 15th of the month. I was unable to collect data after the 23rd because we made our biannual visit to Ottawa, Canada (below), not returning until the beginning of May. I recorded four centimetres total rainfall for Brecon in April, but this excluded any rainfall while we were away. 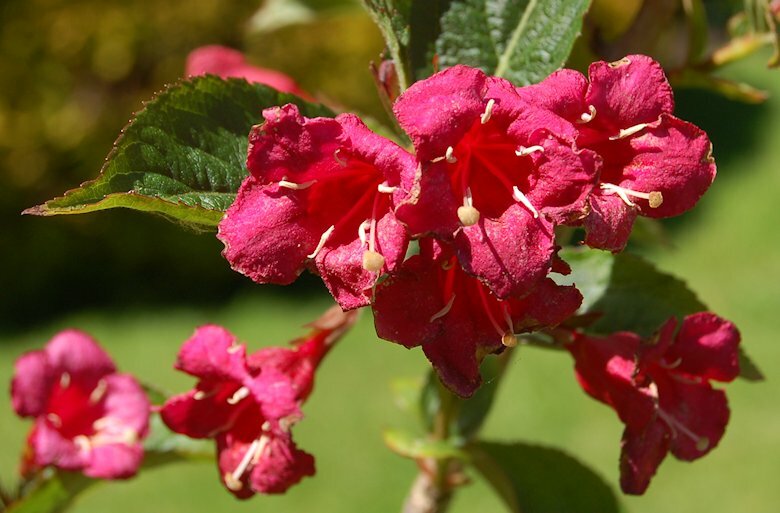 The first seven days of May were pleasantly warm, with the daytime temperature peaking at 24°C on the 7th. 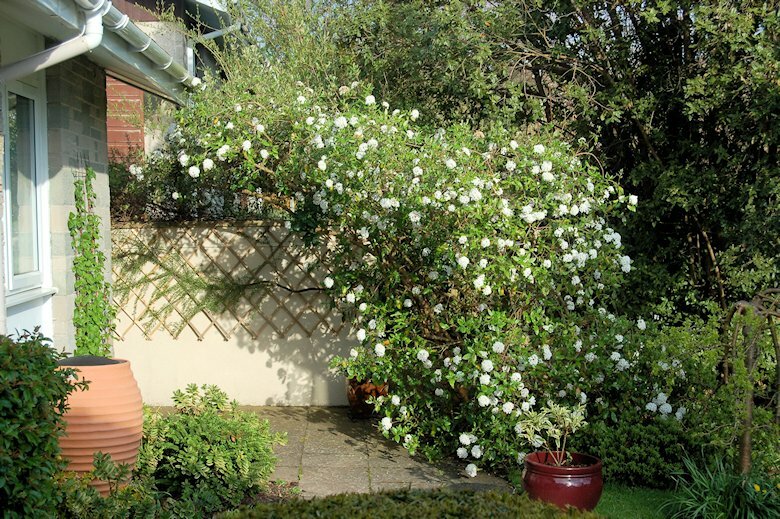 By then the viburnum arch in our garden was in full blossom. We then experienced a much cooler, wetter and windier spell. But the weather had warmed up again by the time we left Wales for a short holiday in Berlin to explore the city and to visit my son Dave, Andrea and their wonderful seven-month old daughter Emma. 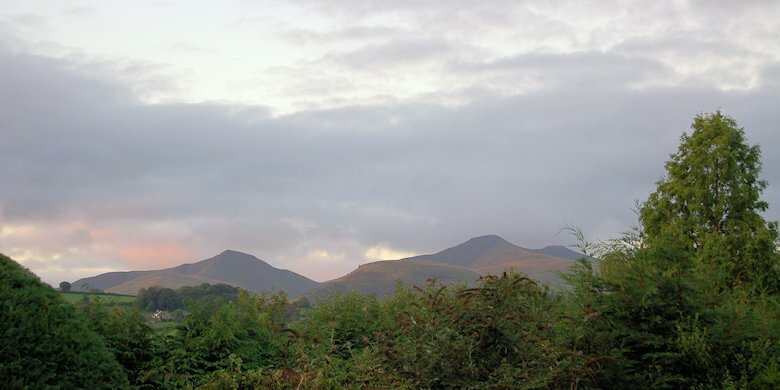 By the end of the month, despite some heavy showers, the daytime temperature in Brecon had reached 24°C. The total rainfall for May was eleven centimetres, the wettest month of the year so far. June continued as May had ended with warm, dry weather, but by the 19th of the month daytime temperatures had fallen to 14°C. We then had two weeks of largely unseasonable cloudy, wet and windy weather. 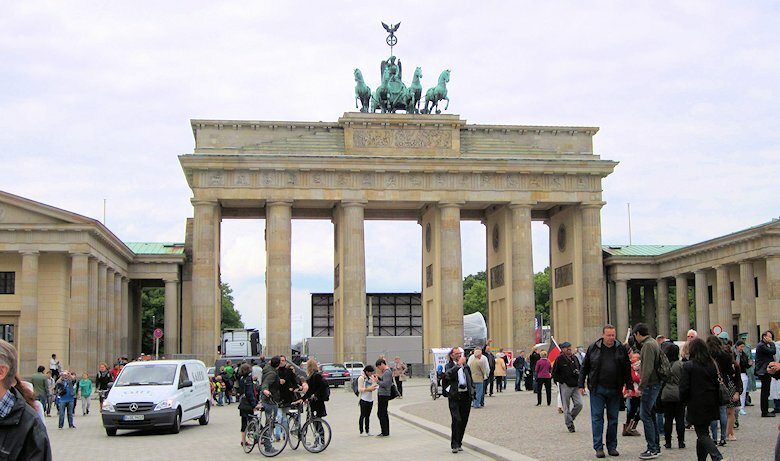 The 19th of June was a singular exception, when the temperature soared to a maximum of 25°C. In the final few days of June the weather gradually warmed up again and we looked forward to an improvement in July. The total rainfall in June was six centimetres, most of which fell between the 13th and 24th. After a cool start, July provided us with wonderfully warm, dry and settled summer weather. We had no measurable rainfall between the 3rd and the 24th of the month. The peak daytime temperatures remained above 25°C for fifteen successive days, reaching a maximum of 32°C on the 13th July. 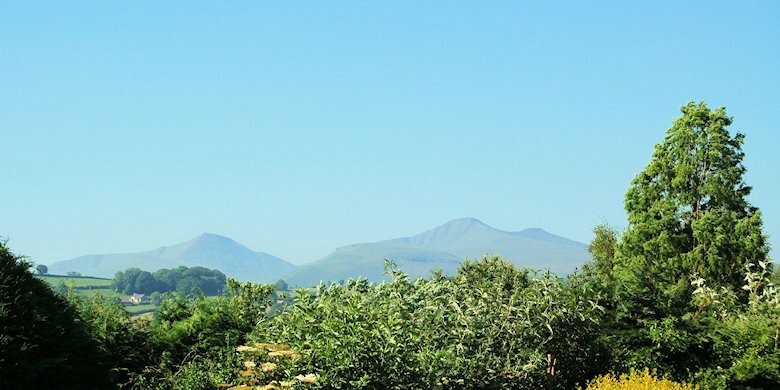 Every morning we awoke to see the Brecon Beacons shimmering in a heat haze. As the soil became more and more parched, we found ourselves having to water the rose-bed every evening. 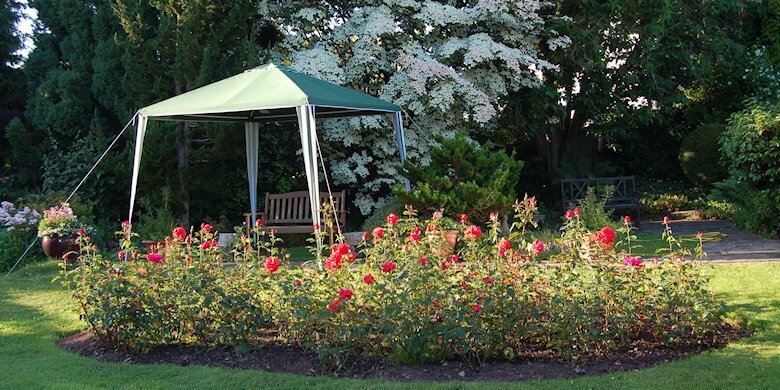 We spent a great deal of time in the garden, sheltering from the afternoon sun under a newly purchased gazebo, or enjoying the late evening sunshine. In the background, the dogwood tree is in full bloom. The heatwave eventually began to break in the final week of July. It rained overnight on the 24th and again on the 28th, 29th and 30th, bringing the total rainfall for July up to a meagre three centimetres. The daytime temperatures fell to a more tolerable level, peaking between 20 and 24 degrees. But what a month it had been! The best prolonged spell of hot dry, settled weather for several years. The first week or so of August was marked by heavy rainfall combined with generally mild or warm temperatures. Nearly six centimetres of rain fell between the 4th and 7th of August, twice that in the whole of the previous month. 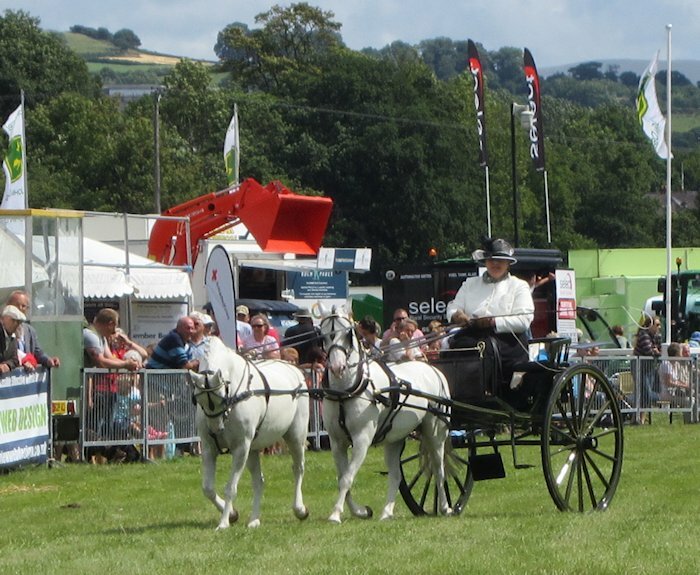 This did not bode well for the annual Breconshire County Show, held on the 8th of the month. Luckily when the day arrived, it was dry and mainly sunny, although a stiff breeze kept the temperatures down. 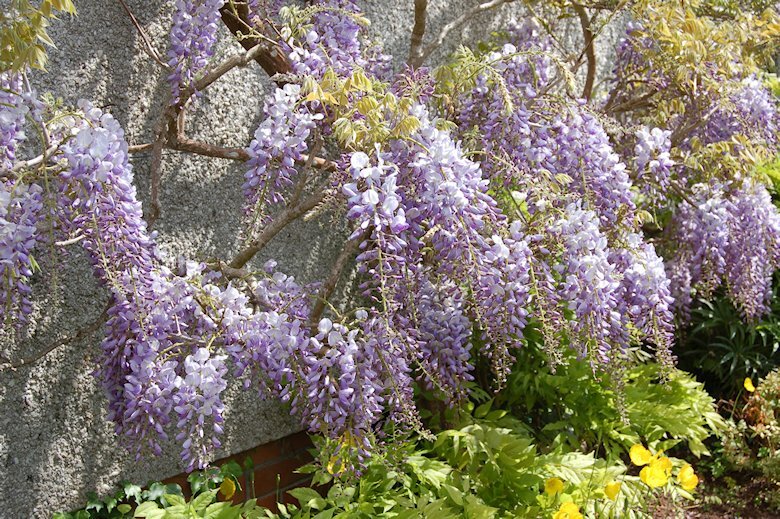 The early August heavy rainfall had a beneficial effect on the garden. 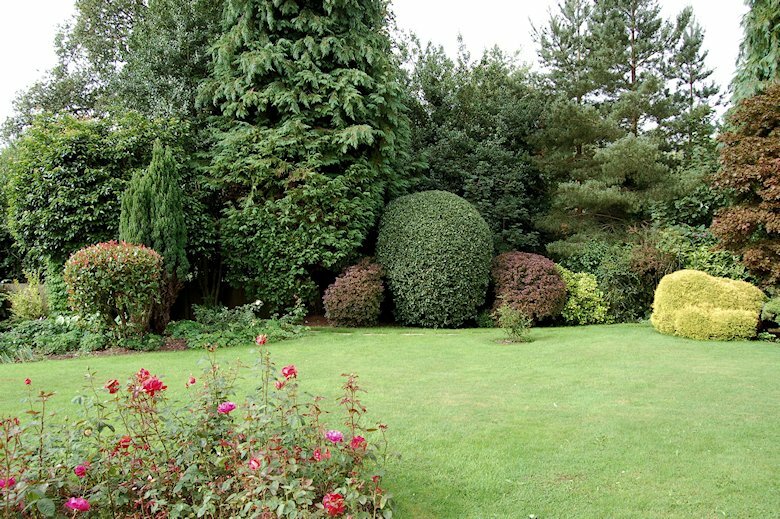 The lawns greened up again after the July drought, and the neatly clipped bushes at the bottom of the garden were at their very best. The bottom of our garden: 11th August 2013. The neatly clipped bushes are (left to right): Photina, Berberis, Holly, Berberis, and what we call our ‘Volkswagon’ bush! The 18th August marked the beginning of another dry spell, which lasted to the end of the month. It was broken only by a short shower on the 23rd. The daytime temperatures during this period peaked between 20 and 25 degrees. On the 20th we visited the parish of Clifford, just over the border in Herefordshire. 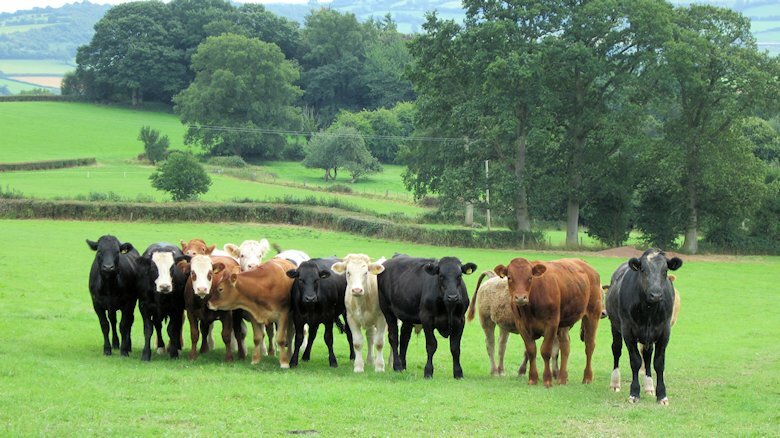 I took some shots of the local church, observed by a group of curious cattle. There was plenty to see in our garden at this time. The buddleia davidii was demonstrating why it is known as the ‘butterfly bush’ (bees also welcome), while the white spirea was putting on a fireworks display. 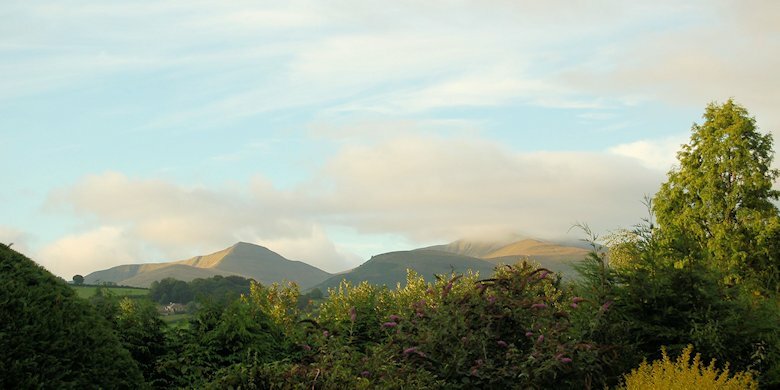 Here in Brecon, the total rainfall in August amounted to nine centimetres. The first few days in September were quite warm, but then from a daytime peak of 26°C on the 4th of the month the temperature fell steadily to a peak of only 13°C on the 18th. This retreat from summer weather was accompanied by strong winds and frequent rain. 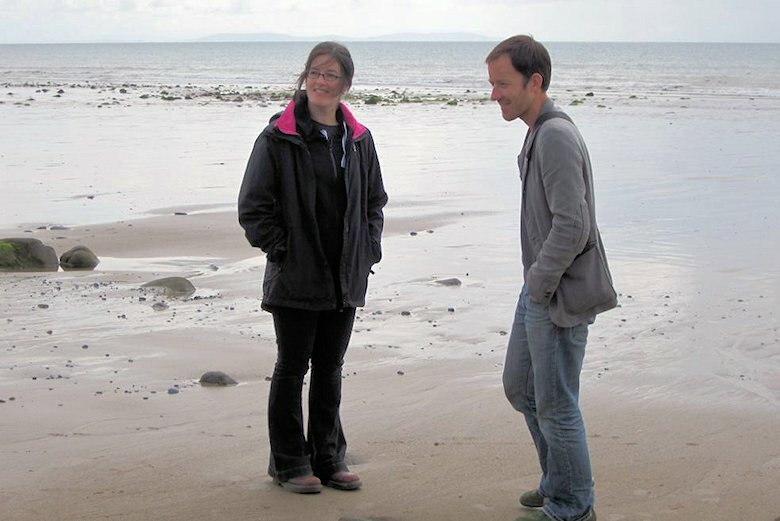 During this period my daughter arranged a family gathering on the 9th September at the Pembrokeshire coastal village of Amroth. Luckily, although breezy and cool on that day, we saw some sunny intervals and only a few short rain showers – not enough to dampen our spirits. From the 19th of the month onwards the rain stopped and days warmed up again, with the temperature peaking at 23.5°C on the 23rd. Surprisingly, only five centimetres of rain fell in the whole of September, mostly on the 9th, 14th and 18th of the month. 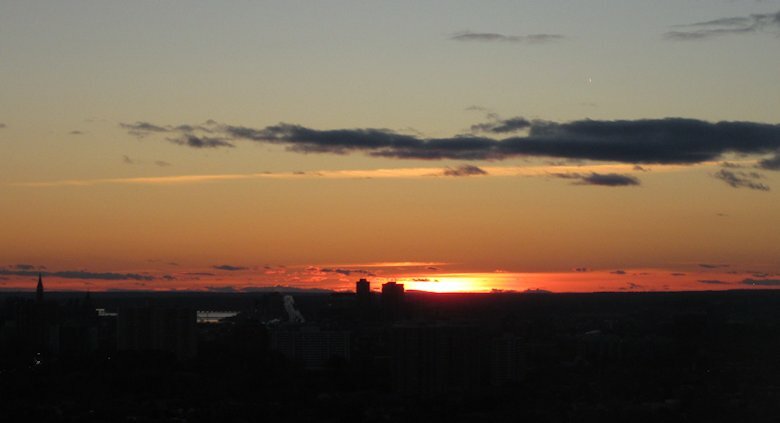 Daytime temperatures gradually climbed in the first week of October, peaking at 22°C on the 8th. Over four centimetres of rain were recorded in this period, and the nights were quite mild with the exception of the 5th and 6th, when the nocturnal temperature fell to 6°C. This mild and wet spell was followed by a dry period accompanied by a sudden dip in daytime temperatures, which remained below 15°C until the middle of the month. The weather became increasingly wet as the second half of the month progressed, and 3.5 centimetres of rain fell in the 24 hour period commencing on the morning of the 21st October. On the 23rd we embarked on the second of our regular biannual trips to Ottawa, so no weather data was collected during the final week of October. I recorded a total of 19 centimetres rainfall in October, excluding any rain falling between the 23rd and 27th of the month. The month began with mild daytime temperatures, peaking between 11°C and 13°C, accompanied by blustery winds and considerable rainfall. 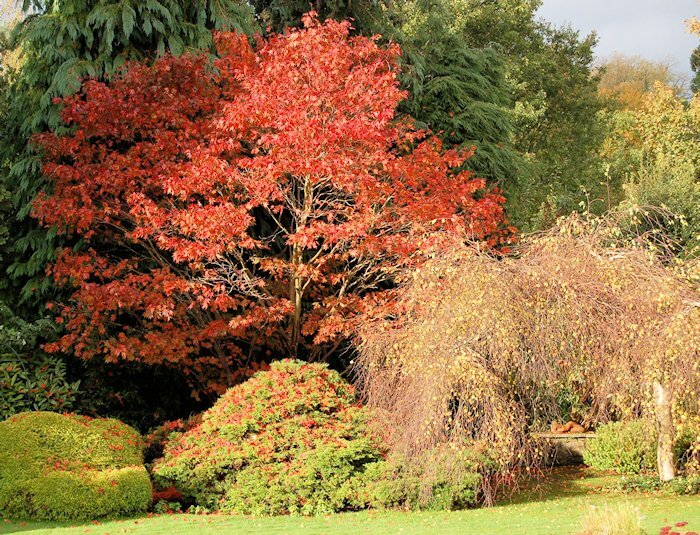 However we enjoyed some sunny spells, too, enhancing the autumn colours in the garden. The middle of the month, too, was generally mild and wet, though we experienced our first frost on the morning of the 13th. As the month progressed, although the daytime temperatures held up well, the nights regularly fell below zero. We had a hard frost on the night of the 22nd, when the temperature dropped to minus 4°C. We had no rainfall in the final week of November, and the monthly total was only ten centimetres. The first half of December was memorable for its lack of rain (barely a trace until the 15th) and its high winds. We suffered gale force winds on the 5th December and again on the 14th. 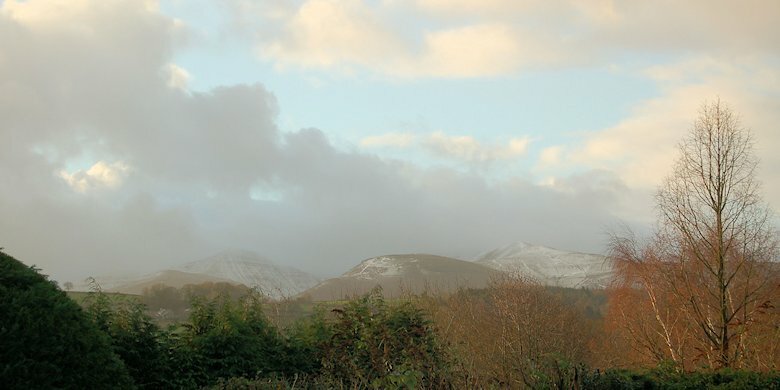 Luckily Brecon town is sheltered from the worst of the winds by the surrounding mountains; exposed areas suffered meanly. 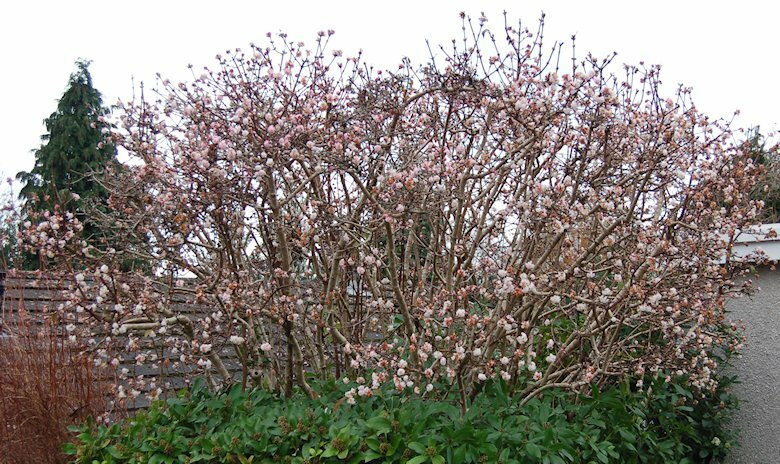 During this period, our winter-flowering viburnum was at its best and we enjoyed some spectacularly colourful morning and evening skies. The middle of December was quite mild with daytime temperatures regularly peaking above 10°C, an absence of frosts, but increasingly heavy rainfall and strong winds. 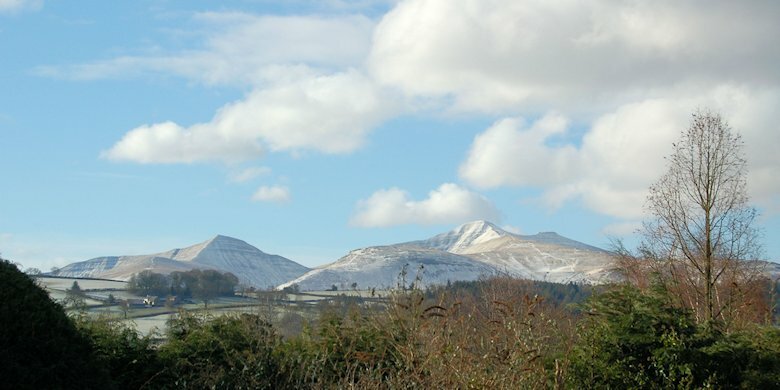 On cold nights such as the 19th of the month, a light covering of snow was seen on the peaks of the Brecon Beacons. The wild and wet weather continued over the Christmas period. On Monday 23rd December Brecon (and the rest of Wales) experienced exceptionally heavy rainfall (5 cm in 24 hours) causing the great old river Usk to flood the surrounding fields. Even main roads such as the A40 and A465 had to be closed and traffic diverted due to flooding. Our normally routine 80 minute return trip to Abergavenny to collect my cousin from the railway station turned into a 2½ hour hair-raising adventure! 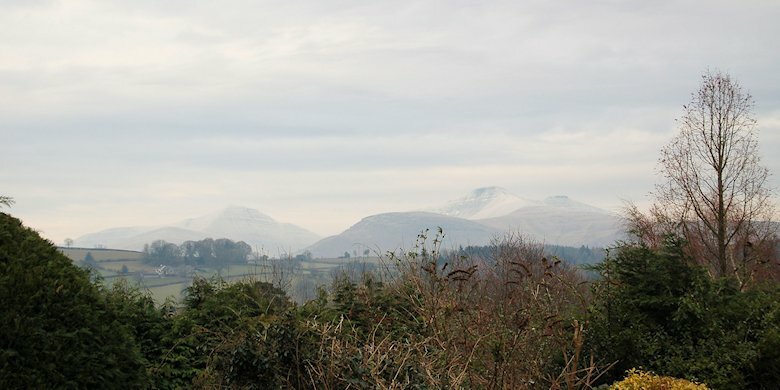 The gales and heavy rain continued into the New Year, and although the high peaks of the Beacons retained their covering of snow, down here at ground level we had nothing but rain. I recorded 23 centimetres of rainfall in December! The highest for some years. As I write the last few words of this blog on 6th January 2014, the gales, floods and heavy rains continue, at least for a while. 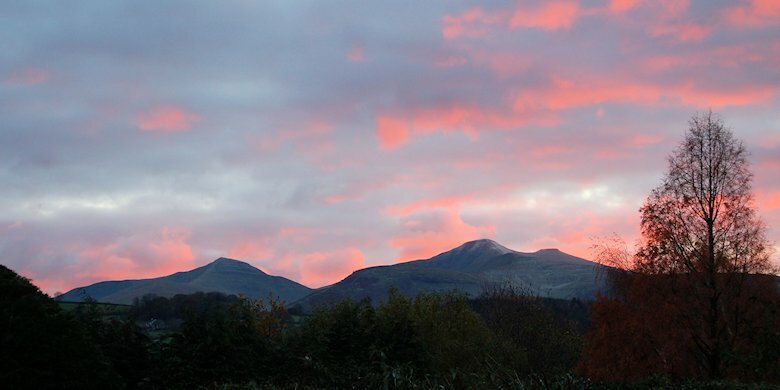 But I’ll close with an example of one of the most memorable features of life here in the Brecon Beacons National Park: our magnificent sunsets.